Welsh production company Tanabi Films, who produced ‘By Any Name’ feature film which is based on the number 1 best-selling novel by Katherine John was nominated in the ‘Best Feature Film’ category and Locked Up short film in the ‘Best Sort Film’ category from a plethora of entries at this year’s prestigious Carmarthen Bay Film Festival, held at the Stradey Park Hotel, Llanelli. The first ever screening of By Any Name was also held during the festival, with over 160 guests from around the UK and the film received excellent feedback from the audience. Samira Mohamed Ali, who is one of the producers and stars as leading lady Dr Elizabeth Santer, a psychologist, who is taken hostage by John West, which is played by lead Actor and Combat expert Cengiz Dervis. In an interview following the screening, Samira said: “The response has been very positive, we wanted to make Katherine proud and very grateful of the opportunity of being able to adapt such a popular novel, which has been on sale world-wide for the last 15 years. Seeing it all come together made me very emotional tonight, and the support we have had from everyone has been amazing. We are thrilled that ‘By Any Name’ has been nominated at the Carmarthen Bay Film Festival following the two recent awards at the North Wales International Film Festival and proud that we have qualified for BAFTA Wales entry for 2017”. Following the screening, the lead actor Cengiz Dervis, who plays John West said in an interview: “I am so happy for everyone involved, it was a beautiful film and I am really pleased that Katherine John has seen her work adapt to the screen in a sensitive manner. I think the audience enjoyed, as the cinematography was excellent and the end project has made me very proud. I gave everything to this role, from the 16 week preparation to be in character on the first day of filming”. Recently selected as one of Amazon’s chosen authors, Katherine John is profiled on most online platforms across the US, South America and Europe. In an interview following the screening, she said, “I am in shock, I was not sure what to expect as I knew that the team at Tanabi had given 150% but it was truly remarkable. Being an independent film, the commitment of the actors to bring the characters alive along with the breath-taking Welsh scenery and the direction created an excellent film. I am delighted and honored to be part of this project and finding out that it has been nominated for the main award at the festival”. The Director of ‘By Any Name’ Euros Jones-Evans said, “Everyone enjoyed the film tonight and I’m very happy that the audience that have read the novel were pleased we stayed true to the story. It was an intense shoot, over 16 days but I feel that audiences around the world will enjoy the film as it has a powerful story and the actors have been amazing bringing the characters to life, and I wish to thank the whole crew for their dedication and hard work in getting this project to screen. I would also like to thank Gravells, Kidwelly for supporting tonight’s screening here at the Strayed Park Hotel, Llanelli”. ‘By Any Name’ is a recent acquisition of Hollywood’s Adler & Associates Entertainment, Inc. headed by CEO Marie Adler. The Alder team are currently at the Cannes Film Market working with various agents to secure global distribution for the film. 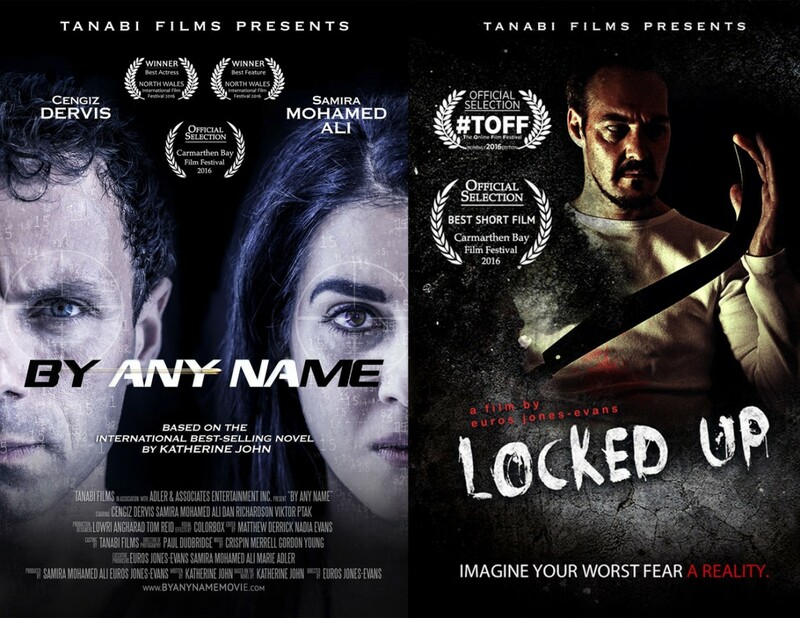 ‘Locked Up’ short film, starring Stuart McNeill and Samira Mohamed has also been nominated for the Best Feature Short at this year’s festival.